Laura Geller's Cover Lock Cream Foundation is used to create the smooth, even complexion you crave with true full coverage. This vitamin-enriched formula effortlessly blends away discoloration, scars, even tattoos, while locking out aging pollutants and environmental stressors for all-day, flawless coverage. It is a full coverage foundation. It comes in 9 shades, listed with their descriptions below. Porcelain: Doll-like complexion. Alabaster skin. Very fair. I find that this is one of the better full coverage foundations I have used. It hides just about everything. And when they mean even tattoos, they aren't kidding. I am Porcelain in this shade collection. Below is a photo of me wearing the foundation with it looking very full coverage. Quench your skin's thirst with Laura Geller's Quench-n-Tint Hydrating Foundation. This intensely hydrating foundation, with a wash of color, has coverage that is as weightless and refreshing as a splash of water. It leaves skin with a natural glow. The foundation comes in three shades, Light, Medium and Deep. I wear Light, which is still a bit dark for me. See below for a picture of me wearing the foundation in Light. To use: apply a small amount to the face with fingertips, starting from the center of the face and blending outward. Repeat application until desired coverage is achieved. Laura Geller Cosmetics are available at www.laurageller.com, www.ulta.com; www.beauty.com and fine department stores. 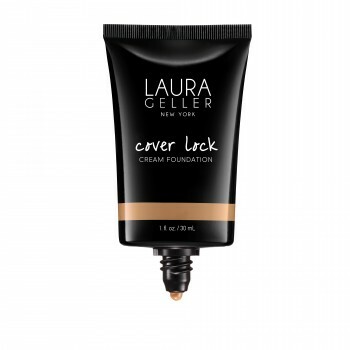 Like Laura Geller Beauty on Facebook: https://www.facebook.com/LauraGellerBeauty?ref=br_rs; Follow Laura Geller Beauty on Twitter:@LauraGeller; Follow Laura Geller on Pinterest: https://www.pinterest.com/laurageller/; Follow Laura Geller Beauty on Instagram: https://instagram.com/lauragellerbeauty and Subscribe to Laura Geller on YouTube:https://www.youtube.com/user/LauraGellerUS.